Playing outdoors with your friends or family members is always fun. We have a fantastic range of play equipment for children of all ages such as swings, water tracks and seesaws. Every child will have a great time with the EXIT toys outdoor play equipment range. Children can sit and play in the small swings and if you want something for more of an adrenaline rush, there are cool duo swings and nest swings. With EXIT Swings, you can easily change the seats so you can enjoy swinging in a different way each time. The EXIT AquaFlow tracks are perfect for kids who like to splash water around. The water tracks are can be constructed in different ways and come in a variety of sizes. There is nothing better than splashing and playing with water. For optimal playing fun, see saws are great. They encourage you to play with a friend, brother or sister, allowing you to go up and down as well as rotating, all at a fast pace. Playing outdoors is the way to keep kids healthy and great for teaching them new things. Here is our full range of EXIT outdoor play equipment. The EXIT AquaFlow water track superset is a water play set for kids. This unique water toy guarantees endless hours of fun. It has various bins with 3 different locks so several children can play simultaneously. The gutters interior side and bins are made of plastic which is easy to clean and watertight. Water flows down through the locks and you decide how much water will flow through the track. At the end of the water track, the water is collected in a bin and can then be pumped manually up to the top. The AquaFlow bins can be put at different angles, for example, straight, in a bend or in a zigzag. Its water tracks are made from cedar wood which is resistant to weather influences such as rain, and therefore resistant to wood rot. The water pump is included. The EXIT Spinner Seesaw is an amazing outdoor toy that goes up and down and also rotates 360 degrees. It is black and green in colour. This seesaw has an extra spring element underneath the seats on this seesaw. Its frame is extremely solid and is galvanized and beautifully black powder coated. The seats are made of hard, high-quality plastic so it is very easy to keep clean. The seesaw has a stable three-legged foot and steel hand grips. 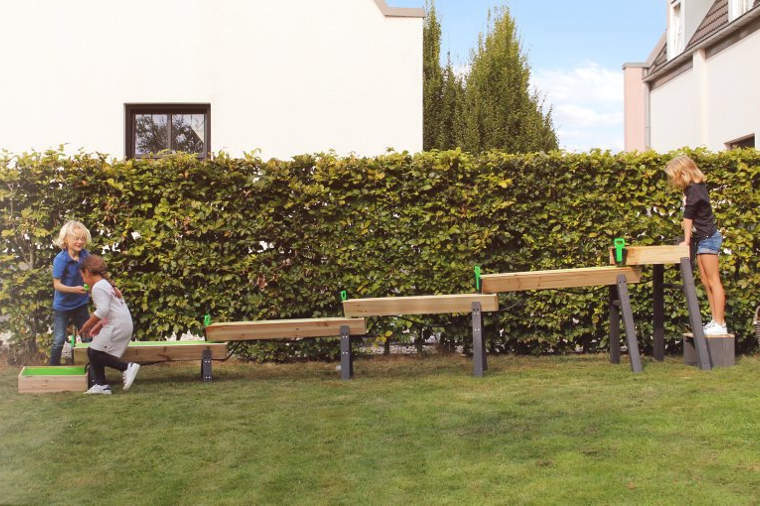 Due to its solid and user-friendly anchoring system, this outdoor play toy is truly unique. Its anchoring system allows it to remain solidly in place in the garden, but it can easily be moved when cutting your lawn. It is weather resistant and the manual is included for assembly. The EXIT Aksent double swing is a 2-seat swing so you and a friend or family member can swing and play together. This Scandinavian designed swing is very durable meaning it will last a long time in your garden ensuring years of playing pleasure. Its frame is anchored firmly to the ground and the strong metal pieces connecting ensure a sturdy and high-quality toy. You can also hang other swing seats like a nest swing seat, a lounge swing seat or a safe baby swing seat. It is made from certified cedar wood making it weather and wood rot resistant. Included is four ground anchors for solid grounding and a manual for assembly. The EXIT Aksent Duo swing + slide is a durable swing that has comes with two seats. Its durable, Scandinavian design ensure years of playing fun. The frame of this swing is anchored into the ground firmly and its strong metal connecting parts means it is a high quality, sturdy playing toy. There is a ladder that can be used to climb up to the platform in order to slide down. Other types of swing seats, such as a nest swing seat, a lounge swing seat or a baby swing seat can be hung off this cool toy. This is made from certified cedar wood making it resistant to weather influences and wood rot. Four ground anchors for solid grounding and a manual for assembly are included. The EXIT Aksent Nest Swing + Slide is a modernly designed swing. This piece of play equipment is provided with a special nest seat and a platform where you can climb and slide down. The slide is lime green colour and nest swing is black and green. The diameter of the nest swing is 98 cm and the maximum load-bearing capacity is 100 kilo. 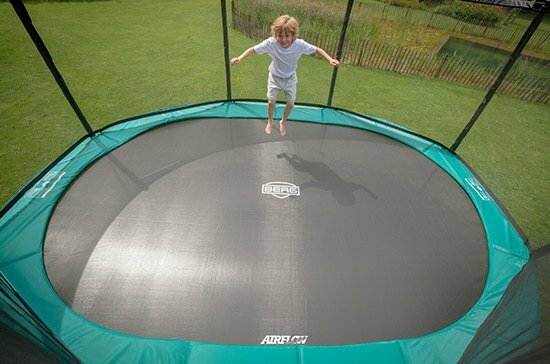 It is easily adjustable in height for children of all heights and it grows with the child. The seat consists of a water-repellent fabric. The metal fittings/2 ground anchors it comes with ensuring a stable outdoor playing toy. Manual is included for assembly. If you have additional questions about our EXIT play equipment then let us know by calling us on 021-496-5132!